A BBQ grill is available for $12 per day (minimum of 3 nights). Pool heat is also available from September-March for $30/night (Minimun of 3 days)! 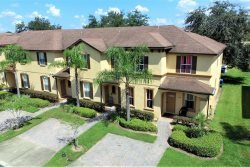 This home is located less than five minutes from Kissimmee's renowned 192 corridor, where there is an abundance of shops and restaurants. It is also a short drive to 429 and the western entrance of Walt Disney World. An easy drive north will take you to the Wizarding World of Harry Potter on the Universal Studios property. With six theme parks and three waterparks all within a short drive, there is always somewhere to explore. Tuscany At Westside Resort is only a few moments drive to grocery shopping, restaurants and other area happenings. Easy access to the major attractions like Walt Disney World Theme Parks (10min), Universal Studios & Islands of Adventure(23min), I-Drive (20min), Legoland (25min), Premium Vineland Outlet (15min) and many other Attractions.